Eden Was the North Pole! Eden Was the North Pole!--A Capsulized History of the Predeluvial World and the Science of Human Behavior. One day, while doing my usual research on Ancient India at a nearby university, I asked a young Hindu student I met there whether he could explain why India, the mother of all human civilizations and religions, knew so little about its own ancient history. He said that Hindus fear they might discover that their families really descended from the lowest and most miserable of India's four castes, the Sudras. At first, I naively accepted his explanation, for it's a historical fact that most of our American forefathers, from whatever nations, were the lowest of the low in their own respective countries of origin. Fortunately, my ancestors refused to believe that only the British Royal Family had the divine right to rule. Later on, I found out that the problems Hindus have with their own ancient history had nothing to do with fear of finding out their grandparents were Sudras. They came to adopt many historical and spiritual traditions that occurred, not in the ancient Indian subcontinent, but thousands of miles northward at the North Pole! Even the Turks and Siberians gratefully acknowledge that the Hindus unselfishly preserved the formers' own ancient history at the expense of their own. It's strange how mental conditioning can blind people to reality. At least, the Turks are willing to admit the truth that the Hindus preserved Turkish and Siberian history. I have actually heard Evangelical Christians say that God has punished those 'polytheistic Hindus' for their paganism by denying them knowledge of their own past. But Christians don't know much about their remote past either. At least, the Hindus know they are the parents of the rest of us in all areas. Furthermore, both the monotheistic Christians and the polytheistic Hindus are guilty of the same spiritual crimes. It's very troublesome for both Christians and Hindus to make sense out of Genesis 4:22: 'And the LORD GOD said, 'now that the man has become like one of US, etc., etc.' Mankind is still too primitive and stupid to know that atheists, monotheists, and polytheists are one and the same where true spiritual wisdom is concerned. We humans differ mainly in intelligence and propensities. I can't even begin to count the times Christians have told me I'm hell-bound for learning the truth about what little religious history I know! There's a strange reason why ignorance of one's spiritual and cultural past plagues the Christians infinitely more than it does the Hindus. You'll find out why in this article. The ancient histories of all the major nations and religions on earth mention a time when the several races of mankind lived in a temperate paradise at what is now the North Pole. We remember them as Aryans (Ari), Krishtaya (Christians), Kurus, and Tur/anians. We also remember them as the maritime nations called Phoenicians or Hya. Even today, their descendants occupy Siberian Russia: Yakuts, Saka (Scythians), and Buryats. According to Hindu legends, they were able to hold on to their civilization for no less than 30,000 years. They thought of themselves as spirits occupying physical bodies. For them, their bodies had no life at all. They were just shells which these spirits occupied and used, just as we drive and manage our automobiles. As long as they did not identify themselves as physical bodies, they were always happy and in good health. They could die only by committing suicide when they felt bored living in the same bodies for a thousand or more years, or through some unintended accident. They seem to have had religions and were either atheists, monotheists or polytheists according to their faulty understanding of the Universal Equation, for the Hindu Vedas and a number of Gods, such as Shiva, Kubera, the Nagas, Indra, Vishnu, and Brahma, originated there. Even famous geographical terms and other expressions found in today's subcontinent India were exported to India from the North Pole. God(s) apparently allowed humans to speculate about religious doctrines and to be atheistic, monotheistic, or polytheistic, just so long as they knew they were spirits occupying dead, unthinking physical bodies. However, when they forgot that truth, becoming more and more convinced that they were live bodies in various degrees, they fell deeper and deeper into degradation as well as religious error. God, Nature, or whatever you want to call The Universal Power entirely ignores mankind's interpretations of life and spirituality. It knows nothing of chanting mantras, Mosaic law, chakras, vain prayers, atheism, monotheism, polytheism, spiritual systems such as Hatha Yoga, Bakhti Yoga, Karma Yoga, Raja Yoga, sectarianism, secularism, dogmas, rules of every description such as making it a sin to attend movies, scriptures, religions, conversions, theories, jihad, etc. We can only come to know what truth is all about by refusing to accept the body as real. Only the spirit encased in or casing the body will make mankind spiritual, healthy, wealthy and wise. The Greek dictum was Man, know thyself. What was he to know about himself? He had to know he was not his lifeless body but only the spirit directing that body. Why must he know himself? Because when he knows himself, he automatically and subconsciously, individually, and collectively begins to think less of 'me' and more of 'thee.' You may also want to know why I combined the story of our North Pole origins with knowledge of Self. I did this because if we don't know where we came from, we don't know who we are. Please keep what I have said uppermost in your mind as you finish this article. Hindutva, an aggressive Hindu nationalist organization, wants us to think the Aryans never left the North Pole and invaded India. However, they can't hide the reality that more than one hundred fifty million Aryans (Ari) or Kurus still inhabit Central Asia. And if that fact doesn't convince anyone, no one will be able to keep their DNA hidden under the rug. 'In December, 1988, Soviet scientists found to their surprise that the Yakutian nationality [also called Saka and Buryat] living in remote Siberia have in their blood the HLA—B70 antigen, which is possessed only by the Hindus of Northern India... Archeological evidence in the Indus Valley, and skull and bone measurements of some people of South India indicate the Siberian origin. The proof appears to be conclusive: One people with three different names: (Yakut, Saka [Scythian], and Buryat (Bharat), the true name of India; the same DNA; the same spiritual and historical traditions; the same names of landforms, rivers, etc. How can anyone keep all this locked in the closet? If the Hindu, Jewish, and Christian myths are true, there is no doubt that the North Pole was the Garden of Eden. It is well-known that at one time, the climate at the North Pole was pleasantly mild and that abundant flora and fauna existed there. It seems that within a few years, we may be able to see the ruins of ancient civilizations under the present polar ice and snow keeping them hidden. Some experts are saying that by the year 2012, the North Pole won't have any more snow and ice. What did the Mayans say about 2012? Drawing of Mt. Meru with Lotus seed vessel. The pre-deluvial Aryans were afraid to sail south of the equator. They thought they would not be able to tolerate the heat and were fearful of falling off the world. Nevertheless, the Koran tells us that Adam (the Turkish word for humankind) left Eden and went to Ceylon. From there, he sailed around the world from east to west, conquering his fear that the world was flat and that he might fall off of it. The Great Flood scattered mankind in all directions, destroying all extant civilizations. 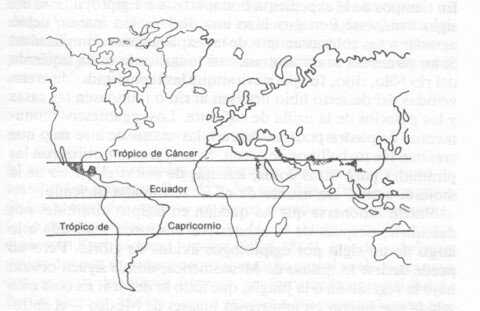 No longer able to travel around the world from north to south, as they did in Eden, humans then had to follow the trade winds from east to west, between the Tropics of Cancer and Capricorn. Mankinds' post-flood civilizations developed between these tropics. See the following Illustration. The ancient Aryans and Hindus thoroughly exploited the natural resources of Northern India: cutting down the forests, misusing the natural resources as we are doing today, and damaging the environment in other ways. Even the Saraisvati River and its companion Hakra(Haggar) dried up, partly because of mankind's folly, creating an almost uninhabitable desert. 'The Mahabharat mentions Uttara-Kuru and the Yama/Yami Samvad (conversation). During their travels, the Pandavas reach Mandara mountain and the Rishi there shows them how the Sapta-Rishis (the 7 Great Bear Stars) circumambulate Meru, literally meaning they go round the pole! 'The axis of the earth is still referred to as Meru-Danda or the Rod of Meru. Regarding cooling of the earth, it could only be the last of the transitory climate change that triggered the ice ages and inter glacial warm periods. 'Ante-deluvian records of 60,000 years were preserved in the libraries of Egypt, as told to Plato by Solon, the Egyptian priest-scribe, when he told him about Atlantis (mentioned in the 'Critias'). 'Considering the last ice age saw humans in England, the Parsis in Iran, Aryans in India (towards the end of it), we can be sure the Zoroastrian Avesta is talking about the sudden freezing of the poles at the outset of the last Ice Age. 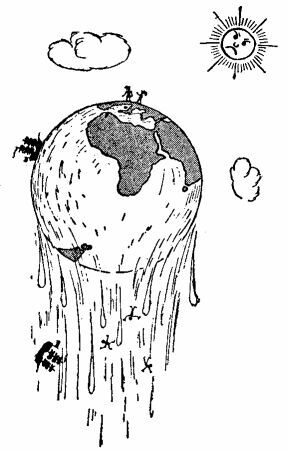 'The Deluge was the end of that period when the polar ice caps released their load of ice in a sudden surge. Indra is called Vritra-hanta or Killer of the demon Vritra. 'Vritra (Lord of Drought) had locked up all water on earth. (the polar cap and the glaciers). Indra (Lord of Rain) freed that body, and thus became lord of the rains! (Giver of Water)'. Using old pictures and drawings of Meru, William F. Warren, who in 1885 published his famous book entitled Paradise Found -- The Cradle of the Human Race at the North Pole, provided us with a drawing of Mt. Meru had it been drawn using the geographical knowledge we have today. 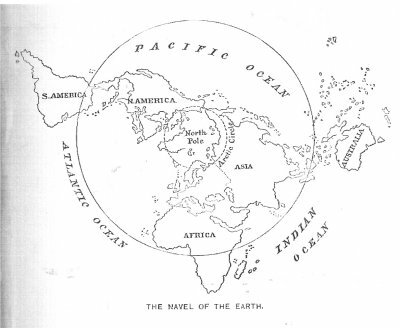 As you can see by the previous drawing, The pre-noachide ancients did not go around the world from east to west, as we do today, but from the North Pole southward. This means they could visit nearly every large land mass on earth while still hugging the shoreline. It was also easily possible that one of the first extant world maps ever made, the Mercateur, was made from another map which someone made from an ancient Aryan map, around 4,000 BC. Evidently, the Arctic Circle was probably still navigable in the summers at that time. 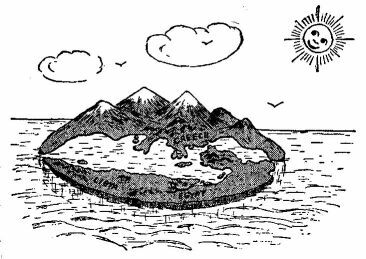 In Indian mythology, Mount Meru was revered as an archetype of the whole world. After the Great Flood, the Aryan hordes spread out from the North Pole in all directions. That's why we see so many place names named after the Greek colonizers Erectheus and Aram, the grandson of Noah. Perhaps Erectheus and Aram were the same group personalized. In Sanskrit, Ara and Arak mean 'the spokes of a wheel'. Aramaic, father of the Hebrew language, used to be one of the principal languages of the Central Asia and the Middle East. We still see proof of the 'spokes' presence in various part of the world, especially in the Americas. In Central Asia, we have Armenia and Arya; Arab in the Middle East; the two ancient kingdoms of Aragon and Navarra in Spain. The Mexican Huichol Indians claim to have gone to Mexico from a port on the other side of the world, called Aramra. From Southern Florida and the Caribbean Sea to eastern South America we have the Arawaks. In Western South America we have the Auraucans. The Aymara (Family of Aram) are thought to be the descendants of the civilization of Tihuanaku. The Iroquois stretch from Canada to the United States. These words, Erectheus, Ara, Aram and Arak have influenced human languages in other areas also: area; aura; aurora; arm; arachnea (spider); ray; radio; radius; era; radiate; race (human groups); arc; reach, reek, army, etc. They are used to imply 'extension outward in time and space.' Truly, these words prove conclusively that the predeluvial world belonged to the Aryans (Turks) and the Hindus. Having spread out from the North Pole in different directions, they renamed prominent landmarks in the new lands in remembrance of Meru Mountain or whatever other names they left behind at the North Pole and Siberia: Moriah and Siyoni (Zion) in Israel; Su-Meru in Mesopotama; Meroe in Egypt (also, M'ru = Pyramid in ancient Egyptian); Olympus in Greece; Baboquivari among the O'odham Indians of Arizona; Citlaltepetl (Mountain of the Stars or Mt. Orizaba in Mexico); Mt. Moray in Peru; Mt. Shasta, California; some now unknown mountains in the Adiron-Dak chain, a one hundred percent Turkish name for the Himalayas (Adrian-Dag) that the Adirondak Indians of the U.S. called the Navel of the world; Homolowvi, which the Hopi Indians named after Himalayas, etc. Caption B. Mt. 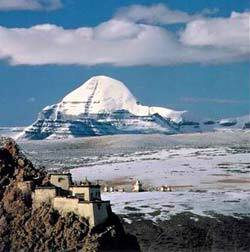 Kailasa, India's Post-Noachide Navel of the World in Western Tibet, is the home of God Shiva and Kubera, India's God of Riches, who was originally from Bulgaria. 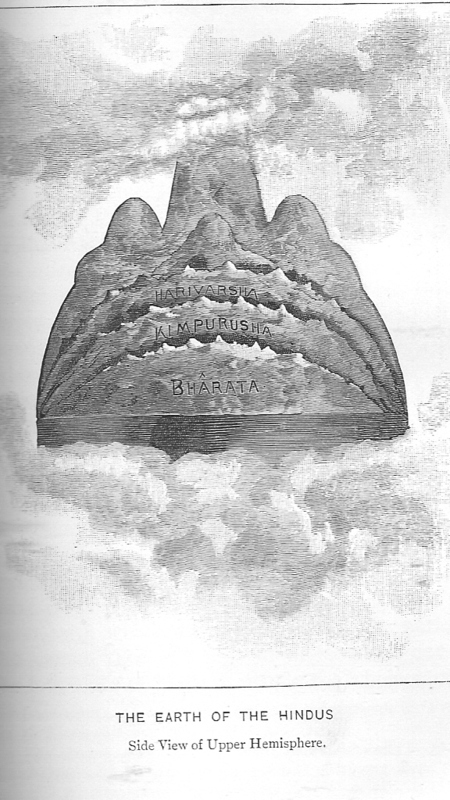 For the O'odhams, Quivari (Kubera) is the mountain and God I'itoi or Sewa (Shiva) lives within it. Babo derives from the Sanskrit Babu, meaning Grandfather. Kailasa was said to be guarded by poisonous serpents. Archeologists tell me that Baboquivari has more than its share of rattlesnakes. Caption C. The Great pyramids of Egypt. M'ru means "pyramid" in ancient Egypt. All kinds of guesses are made about the purpose of the Great Pyramids. In reality, they are reminders of the North Pole, the original Meru from which all humans fled. 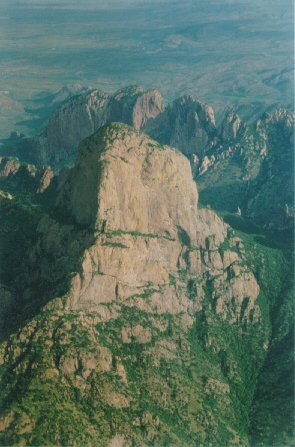 Such mountains as Mexico's Mt. Orizaba, California's Mt. Shasta, Japan's Mt. Fuji, Israel's Mt. Moriah, Peru's Mt. Moray, and countless others dot this entire globe. Nearly all are reminders of where all humans originated -- The North Pole!. Krishna was the Tara (protective father of Brahma, Maheshvara (Moses) and Sarasvati. Terah was the father of Abraham and Sarah. Abraham was a patriarch -- a father of nations. Sarah was a matriarch -- a mother of nations. Sarasvati was a woman of exceptional beauty. Sarah was a woman of exceptional beauty. Brahma was the half brother of Sarasvati. Abraham was the half brother of Sarah. Brahmavarta was a region of India. Sarasvati was a great river that passed over Brahmavarta. Hakra or Hakkar was a tributary of the River Sarasvati. Haggar was a servant of Sarah and the mother of Ishmael. A name of Krishna, father of Brahma, was Malika Sadhaka (King of Magicians). Melchisedec, King of Jerusalem, was a mentor of Abraham. Krishna, Sarasvati, and Brahma fled Haran and went to Jerusalem? after a flood. Abraham and Sarah fled Haran and went to Jerusalem after a flood. My conclusion: Abraham, Sarah, and Melchisedec were Brahma, Sarsvati, and Malika Sadhaka (Krishna). This information and the rest in this article should inspire us to realize we are all from the same source, encouraging us to respect one another. Most Jews and Christians conclusions: Gene Matlock is forcing us to swallow a Hindu lie, in order to make us lose our faith or convert to Hinduism. Most Hindus conclusions: What Gene Matlock says is a Jewish and Christian lie, in order to weaken our faith and encourage us to convert to Christianity or Judaism. We of the West are especially hostile to Hindu ideas of how homo-sapiens-sapiens or Modern Man made his debut in the world. Even we who are religious often insist that mankind evolved on this planet from single cell organisms, to fish-like creatures, to apes, and then to humans. The Hindus claim that early mankind came here from other planets. Our Bible states this more than clearly, but we refuse to believe it. In Genesis, we read that they were the Nephilim (the Divine Ones). According to the Bible, when they arrived here, they saw that mankind was degenerating to animal level. At that time, the races of mankind were the Yadu, Turvasa, Druhyus, Anu, and Puru. The Nephilim mated with the daughters of men, implanting the seeds of their own divinity into their wombs. After that, God destroyed most humans in a big flood, allowing only a few to live. Evidently, the previous races were Cro-Magnon man. It is also possible that prior to the Cro-Magnon, most of the Neanderthals were destroyed similarly and the Cro-Magnons put in their place. The Greeks called these Divine Ones Nuphylum (The Phylum of Noah). In Sanskrit, they were called Navalin (Star Ship People) and Anunaka/Anunaki (From the vault of Heaven; One who is from the Sky. From the place where there is no pain; God Shiva. Caption. 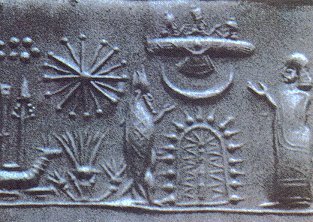 A clay relief of a Sumerian Anunaki altar. We should not forget that all ancient civilizations were closer timewise to the stories of our Outer Space ancestors than we. How could they have known about people living on other planets -- unless those stories were true? The Sumerians, Mesopotamians, and Akkadians called them Anunaki (Children of the God of Heaven; Those of Royal Blood; Princely Offspring; Sky Gods; People of Heaven and Earth). Most Westerners reject the claim that our ancestors came here as full--fledged human beings, even though the peoples I have named were not far removed in time from our Outer Space ancestors. According to our Bible, and even the holy books of the Hindus, the new divine men entered the world through the bloodline of Japhet/Yayati. Japhet (Skt. Jyapeti) was also India's God Shiva, Jupiter, Zeus, Apollonius, Apollo, India's God Krishna, Melchizedek, and even our Jesus Christ. From Japhet/Yayati, they spread to the close relatives of Yayati/Japhet: Yadu, to Yadava, and then to the Jews or Yahuda. It seems that the Anu were favored in the same way. The Middle Eastern Druze may also be the descendants of the Druhyus. The DNA of the Druze shows that their ancestors came from ancient India. Even today, they worship Gold Krishna and read the Vedas. Yet, their millenniums-old home is Israel, Syria, and surrounding nations. They will usually be Jews, Muslims, and Christians publicly, practicing their own Hindu-derived religion secretly. I must confess that I used to be a fanatical believer in Darwin's theory of evolution. But my research, which led me to the outer space founders of all gods and religions, has turned me into an Intelligent Design Creationist. Unfortunately, like his monotheistic competitors, the Christians, and even atheists, Dr. Pande cannot see that Hinduism is as much in trouble as Christianity is. He is allowing sectarian, spiritual and cultural chauvinism to blind his spiritual vision. The peoples of the world must look beyond vain comparisons, religio-cultural bias, false ideals, and evil urges to convert their fellow atheists, monotheists, and polytheists to competing ideologies, whatever they may be. We must bring ourselves to see that we are all spirits walking around in physical bodies. This is not so difficult to do if we'll just think about this for a while. All the evils on earth happen when men think they are bodies and nothing more. It was not Darwin’s fault that mankind tends to think of himself as animal first and foremost. The fault lies at the feet of all mankind. Until we awaken, we well deserve everything that is happening to us. We know it inwardly anyway. If we don't act right now, this ignorance leading to indescribable evil may get worse in the near future. '...All the most ancient traditions of mankind represent him as having commenced existence in a divine fellowship, and as having lost this holy and blessed estate only through sin. This view of the origin of religion has prevailed from the beginning of traceable history among all nations of the earth, varying only to such slight extent as would permit polytheistic peoples to conceive of the primeval divine fellowship polytheistically, and the monotheistic peoples monotheistically. The solid traditional belief of the whole human family in every age of the world has been that man began his existence pure and sinless, and in conscious and divine communion. This is the pan-ethnic no less than the Biblical doctrine of the origin and first form of religion among men. William Warren stated in his book exactly what I say in this article. Mankind must again know exactly who and what he is... If he will not do this, he may again bring about his destruction, along with all he has accomplished until now. Only recently, scientists have come to suspect that one cell organisms from Outer Space could not possibly have evolved to mankind. Therefore, the 'authorities' Warren discussed are trying to make other speculations about Darwin's Theory, which will also someday be proven invalid. 'For the Creator, we are like programmed machines, each executing his or her program. After all, the genetic code is the world's best and most efficient self replication and evolving indestructible program, that has endured 600 million years and counting. The Bible tells us that while flood waters killed most people in the world during the time of Noah, this time it will destroy most of us with fire and heat. What races and individuals will The Divine Ones put out of business in 2012? Are you and the racial or cultural group to which you belong inscribed on that list?